Taking its cue from 70s revenge movies like Charles Bronson’s Death Wish series, Law Abiding Citizen is the story of Clyde Shelton (Gerard Butler) an everyday joe whose life is turned upside down when his family is murdered in a home invasion. However, when district attorney Nick Rice (Jamie Foxx) plea bargains a deal to set the killers free, Clyde decides to take matters into his own hands and dispense his own kind of justice. The film is directed by F. Gary Gray, and features a new score from the absurdly busy Brian Tyler, his sixth score of 2009 following features like Dragonball Evolution, Fast & Furious and The Final Destination. 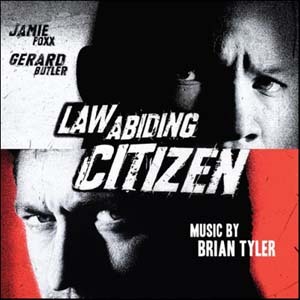 As much as it pains me to say it, Law Abiding Citizen is one of the dullest scores of Brian Tyler’s career to date. Now, don’t get me wrong; I like Brian Tyler a lot, I think he’s a superbly talented composer, and I adore his work on scores like Darkness Falls, Children of Dune, Partition, Eagle Eye, and several others besides. In recent years, though, he seems to me to be in danger of becoming over exposed, and of writing himself out. In the last three years he has written thirteen scores, the vast majority of them in the action/thriller genre, and they are all starting to blend together into one mass of increasingly generic-sounding music. I love distinctiveness in film scores, originality and uniqueness, but over the past year or so I am finding it increasingly difficult to tell one Tyler score from another. They’re all big scores with lots of electronic beats overlaying a large orchestra, and generally tend to comprise mainly of relentless action cues interspersed with tension and suspense material; and Law Abiding Citizen is much of the same. In its broadest sense, there isn’t a whole lot wrong with the music Law Abiding Citizen. If your exposure to Brian Tyler’s music is limited, I can well imagine it coming across as a lively, exciting thriller score. I think my problem is that I’m getting bored with the sound. I knew what this score was going to sound like before I played it. As I said before, it’s a big score with lots of electronic beats and metallic percussion overlaying a large orchestra, and comprises mainly of action cues interspersed with tension and suspense material and a couple of more sensitive moments for piano and guitar, ostensibly as a reflection of Gerard Butler’s characters memories of his dead family. Some of the action music is quite exciting. The opening cue, “Designs”, presents the score’s core theme, a low-key, noble sounding string piece which is passed around from strings to brasses, accompanied by driving rhythms and propulsive electronic percussion. Later, cues such as “Origins”, “Methodology” and “Guardian Angel” raise the tempo a little with more aggressive, energetic pulses and thrusting, brisk string writing. Elsewhere, however, a lot of the ‘downtime’ is given over to fairly standard suspense music; shifting string tones, nervous tick-tick rhythms and moody, ambient textures that create a general atmosphere of non-specific tension. Once in a while Tyler introduces a new texture. Piano and guitars feature alongside the orchestra in “Predestined” and “Stalked”, a lovely sentimental piano element features in “A New Start” and “Unconfession” giving the cues a bittersweet ambience, while a neo-classical violin solo gives “The Execution” a slightly surreal, detached feeling that stands at odds with the rest of the score. However, these moments of interest are generally few and far between, and for the most part the score just rumbles on, being all tense and edgy. On the surface, this is all fine – it’s exactly what the film needs, and it meets the director’s wishes – but it still left me uninvolved. I guess what I’m saying is that I really wish someone would hire Tyler to do something else; a comedy, a western, a sweeping romance, something where he can get himself out of this musical rut and explore other aspects of his musical palette. On its own terms, Law Abiding Citizen is a solid, workmanlike action/thriller score, and god knows everything Tyler writes is a huge step above the dross we heard in Transformers 2 and Watchmen. But, still, I can’t shake that nagging feeling that Tyler is writing pretty much the same music over and over again with each score he attempts in this genre, and it’s starting to get a little exasperating. Music composed and conducted by Brian Tyler. Orchestrations by Pakk Hui, Tony Morales and Keith Power. Recorded and mixed by Joel Iwataki. Edited by Joe Lisanti. Album produced by Brian Tyler.